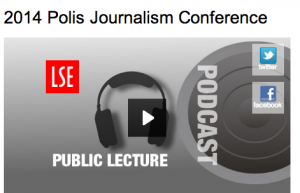 Find here the 2014 Polis Journalism Conference Schedule. The conference will be live-tweeted from @PolisLSE, @MediaLSE, and @nuqsh . Follow Polis Director Charlie Beckett at @CharlieBeckett. The theme of this year’s Polis Annual Journalism conference is Transparency and Accountability. The day will cover everything from whether the Guardian is right to publish the Snowden files to how the UK’s press should be held to account. It is our fifth conference and #Polis14 will be bigger and better than ever before. There will be around 50 journalists speaking as well as academics, politicians, lawyers and activists. There will be keynote speeches, conversations and panel debates in the main hall. And we will have two other parallel venues for workshops, debates and presentations on all aspects of transparency and accountability journalism. We invite anyone with an interest in news media to attend – it’s free and we provide sandwiches and drinks. We will also have free networking drinks from 16.45, at the end of the conference. If you have a journalism start-up idea, a new tool or innovation and you’d like to showcase it for free then get in touch. You can keep up with Polis by following either @CharlieBeckett or @PolisLSE on Twitter or email polis@lse.ac.uk to sign up for our newsletter. We’re also on Facebook and Tumblr. We are grateful to the support from the Knight Foundation, the BBC Academy and the European Broadcasting Union, as well as Leuchtturm1917. Register for free tickets for the conference here. Find here our press release for the conference. You can see the schedule and video from last year’s conference here.